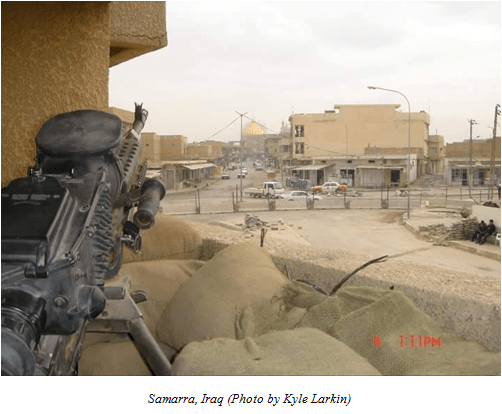 “Minarets,” a short story written by Operation Iraqi Freedom veteran Kyle Larkin, is a raw, hard, highly descriptive narrative that gives a glimpse into an infantryman’s experience on a cold, eerie morning of the Iraq War. For readers who have experienced combat, the story is like a nostalgic trip back to the war. For civilian readers, it helps lend an understanding of the daily life and observations of soldiers in combat. Larkin’s open, honest, and descriptive writing style leaves little to the imagination, painting a vivid picture of the Iraq experience. 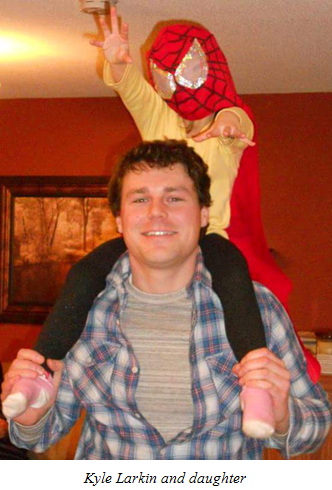 Larkin is an Army infantry veteran who fought in Samarra, Iraq in 2004-2005 with Charlie Company, 1-128 Infantry. After his service, Larkin attended the University of Wisconsin – La Crosse, double majoring in Literature and Philosophy and graduating with honors. He also received a Recognition of Excellence award from the College of Liberal Studies. He began writing after developing an interest in war literature while working on a genealogy of post-traumatic stress disorder for his philosophy capstone project. “The first time someone suggested that I read a war novel, I remember thinking, ‘Why the hell would I want to read a book about war? I’ve been there. It was terrible. That’s the last thing I want to read about,’” Larkin says. But after reading The Things They Carried by Tim O’Brien and All Quiet on the Western Front by Erich Maria Remarque, he was inspired to draw upon his time in the military to express himself. He was encouraged further by his English professor, who helped him to explore literature and challenge ideas through writing. A particular occasion in class served as a springboard. Larkin believes that works of fiction by veterans are important tools in providing insight and understanding regarding war experiences to those who haven’t served and society as a whole. Larkin’s goal is to write a novel about his experiences in Iraq, using “Minarets” as the first chapter, and to submit more short pieces that can be used in his novel. He is currently working on a literary essay on trauma and post-trauma, veteran suicide rates and their causes and how the current dialogue, understanding, and culture surrounding PTSD can and should change. You can read “Minarets” in The Blue Falcon Review, Vol. 2. You can also find “Convoy” here.